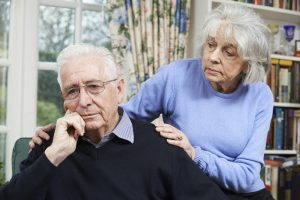 Lewy Body Dementia: Symptoms, treatment, and the challenges that come with caring for a loved one living with this disease. For this post, we spoke with Nurse Beckie, FirstLight Home Care resident nurse and Certified Dementia Practitioner. Lewy body dementia (LBD) is a disease associated with abnormal deposits of a protein called alpha-synuclein in the brain. These deposits, also known as Lewy bodies, affect chemicals in the brain whose changes, in turn, can lead to problems with thinking, movement, behavior, and mood. It is the third most common cause of dementia, after Alzheimer’s disease and vascular dementia. Lewy body dementia affects more than 1 million individuals in the United States. Typically, early signs of this disease begin at age 50 or older, although sometimes younger people have it. Historical data has also shown that LBD affects more men than women. Speaking in a soothing tone and validating his or her concerns. Breaking out tasks into easier steps to help with focus, and developing daily routines to reduce confusion. As Lewy body dementia advances, your loved one may require more personal assistance due to a decline in thinking and movement abilities. In the later stages of the disease, they may depend entirely on others for assistance and care. You both might need outside support that is customized to your needs and can evolve as the disease progresses. If you are caring for a family member living with Lewy body dementia, learn how FirstLight’s Dementia Care Program can give you peace of mind and make a difference in your loved one’s care. Our Respite Care Services allow you to take some time off from your responsibilities as the primary caregiver so you can focus on yourself for a while. If you have questions or caregiving tips that you want to share, join the conversation on our Facebook page. This is my 2nd try as the robot question mucked up my initial attempt. My wife has suffered from Lewy Body for close to 25 years, and I don’t know how much longer I can continue to care for her effectively 24/7/365. Hi Saul. Thank you for your comment. It is such a difficult disease, not only for the patient but for the caregiver as well. If you have questions, you can always Ask Our Nurse https://www.firstlighthomecare.com/care-library/ask-our-nurse/. And if you need some assistance, we can provide respite care. We trust that our caregivers will take care of you and your wife just as you were their own family. Take care.